To be truly bike-centric, in the still car-centric U.S., you need a bike that can work with the dominant infrastructure despite its limitations. A few years back, I revived a huge passion for cycling and bike advocacy. My goal was to really use the bike as my primary, if not exclusive, mode of transportation. However, it quickly became apparent that this was impossible for the following reasons. Bridge Bike Lane not yet even halfway. The San Mateo Bridge has no way for bikes to cross. The Bay Bridge has half a bike lane that sits half finished. BART has scarce space for bikes at crucial times. Second, meeting friends out somewhere meant the bike or I got left behind if they travel to a second location. Bike lanes often stop at overpasses. Finally, even off the bridges, car-centric infrastructure is pervasive. Many places are still designed for drivers and no one else. Technically, you can ride it but at your peril. Some of these issues were mitigated by heavy use of bus and train, and by inspiring a number of friends and family to create a network of bike racks on our cars. Friends with bike racks are few. Bus bike racks fill up quick. The few bike racks on buses were often full. So cyclists must wait up to an hour for another one which also might be full. BART, at the time, had outright bans on bikes during rush hour: when cyclists needed it. They've since revoked this. Nevertheless, it is a real challenge getting a full size bike on board. CalTrain restricts bikes to two "bike cars" that are stuffed during rush hour. So cyclists are bumped to the next train like with the bus. What to do? The answer turned out to be getting a folding bicycle. Though the latest folding bikes are quite fast and elegant, many cyclists still view folding bikes as oddly-shaped, slow, and flimsy, contraptions. If even cyclists felt that way, it was a question how these could appeal to the non-cyclists I am still hoping to inspire. Nevertheless, they seemed to solve many of the issues I was facing so I gave one a try. Barring a few missteps (more on that in future installments), the decision has been a great success. Folding Bikes in luggage Cars. Folding bikes fill any gap in bus, train, plane, ferry, or car schedule while giving you full confidence you can keep them while you use alternate transport. 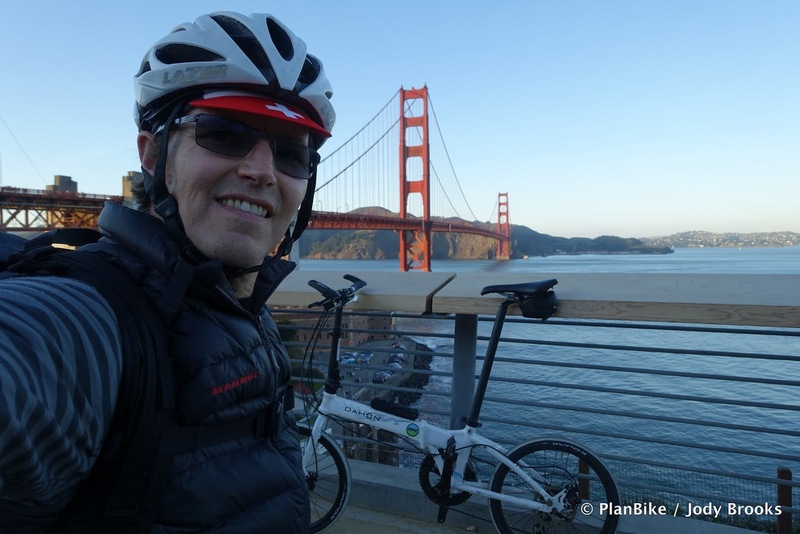 With a folding bike, you always have a ride on the other side of the bridge, road, mountain, or ocean, that is too dangerous or impractical for bikes. They are the perfect catalyst to link all transport modes into a working solution. The only other transport mode that comes close to being this flexible are legs but legs are not nearly as fast. Folding Bikes easily fit in cars. With a folding bike, neither you nor your friends are left behind when you travel together, even if you used different transport modes to meet. No matter what mode of transport you take as a group, the folding bike can fit. You are never bumped or banished from using any transportation resource. For this reason, folding bikes are the ultimate social bicycle. They collaborate nicely with whatever transport your friends choose or with whatever safe/effective transport mode is available. Folding Bikes fly in a regular suitcase. Folding Bikes are welcome in stores. Folding Bikes fit in tiny closets. This ability to fit inside means the bike is less vulnerable to theft or vandalism at typically inadequate external bike storage. That is a huge relief to many cyclists. If all that weren't enough, folding bikes have evolved way beyond a mere contraption. They are now vehicles of considerable performance. 50km+ on a good Folding Bike is great. Although I still get teased for riding on a "toy", I've kept up with relatively fast peloton's of road bikes on 50km rides with no problem. After that, the heckling stops and the questioning starts about what they weigh (8.6kg - 13.6kg) and what they cost ($500-$5000). Now, folding bikes are all I ever ride. The performance and convenience are too hard for a regular bicycle to match. They even look cool once you get used to the small wheels. If you've encountered the same commuter cycling challenges I have, they are worth a serious look. Next time, I'll talk about which ones I got and why. There is a lot to consider.